Vicente, R.; Pastor-Satorras, R.; Smith, E.; Kepler, T.B. The next step in the understanding of the genome organization, after the determination of complete sequences, involves proteomics. The proteome includes the whole set of protein-protein interactions, and two recent independent studies have shown that its topology displays a number of surprising features shared by other complex networks, both natural and artificial. In order to understand the origins of this topology and its evolutionary implications, we present a simple model of proteome evolution that is able to reproduce many of the observed statistical regularities reported from the analysis of the yeast proteome. Our results suggest that the observed patterns can be explained by a process of gene duplication and diversification that would evolve proteome networks under a selection pressure, favoring robustness against failure of its individual components. Vicente, R., Pastor-Satorras, R., Smith, E., Kepler, T.B. 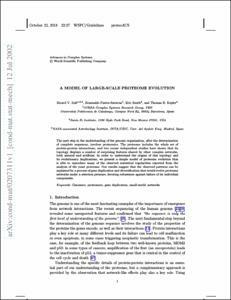 A model of large-scale proteome evolution. "Advances in complex systems", Març 2002, vol. 5, núm. 1, p. 43-54.